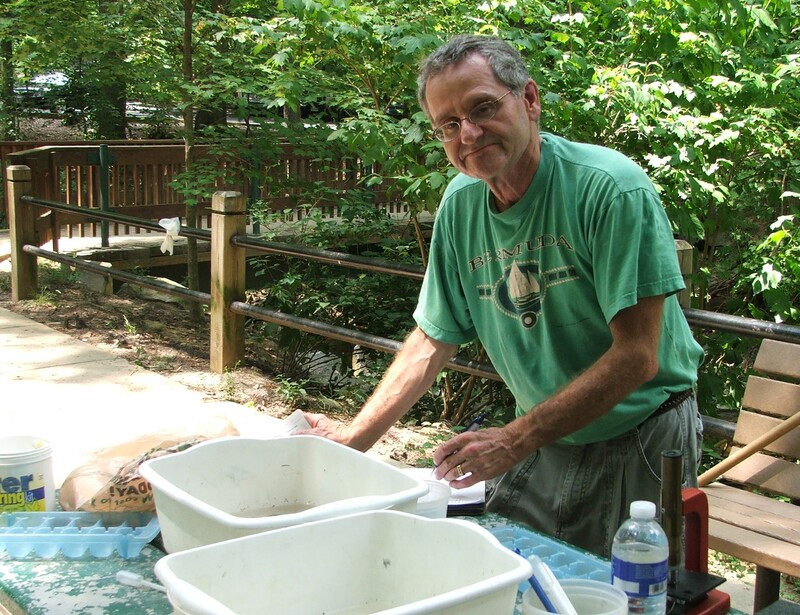 John Bernard volunteers to monitor stream health at Lubber Run. Photo by J. Bernard. I began my career as a citizen scientist with the Spring 2010 ARMN training class. Among the volunteer activities approved for service hours, I enjoy participation in one of several Arlington County sponsored stream monitoring volunteer teams. After I completed a class given by the County, I joined the team volunteers at Lubber Run. Stephanie Martin, Lubber Run Stream Monitoring Team Leader. Photo by J. Bernard. There under the direction of Team Leader Stephanie Martin, we monitor the Macroinvertebrates in Lubber Run. We collect and count these “stream bugs” 4 times yearly in the winter, spring, summer, and fall. It is safe, fun, and gives an opportunity to make a difference. Macroinvertebrates are small organisms that live in our streams, seen with the naked eye, and lack a backbone. These “stream bugs” live part of their life cycle in the streams and depend on them for habitat and food. Some are more tolerant of stream pollution, which makes them good indicators of water quality. If the “bugs” found in the stream are the more tolerant types to pollution, the stream is impaired; a good variety of “bugs” in the stream indicates a healthy stream. Monitoring these “bugs” helps compare a stream’s health before and after a stream is restored, or pollution prevention practices are put in place. If a stream used to have only a few bugs living in it, and now has more types of bugs present, the stream’s health has improved. Stephanie also participates in the County’s Bacteria Monitoring on Lubber Run which are collected and tested monthly. This program was developed to identify any hot spots with higher bacterial levels, and to help with identifying potential sources of bacteria. The results of both of these programs are part of the environmental data that the County uses to monitor the long-term trends of our streams. 40 % of Arlington County has been converted to impervious surfaces like roads, buildings, and parking lots. Impervious surfaces impact and change the character of a stream health with increased runoff, causing increased stream temperature and flash floods after rainfall. The results are increases of sediment and pollutant loads on streams. The County is implementing stream restorations, green streets, and the numerous things homeowners can do to reduce runoff to improve and protect our streams. Once these are in place, the stream monitoring data will help the County determine success of these programs. Details on the Stream Monitoring Volunteer program can be found on the Arlington County Environmental Services website. Follow the links on the lower left of the page under “Monitoring Pages” to read about all the team stream sites and monitoring results. 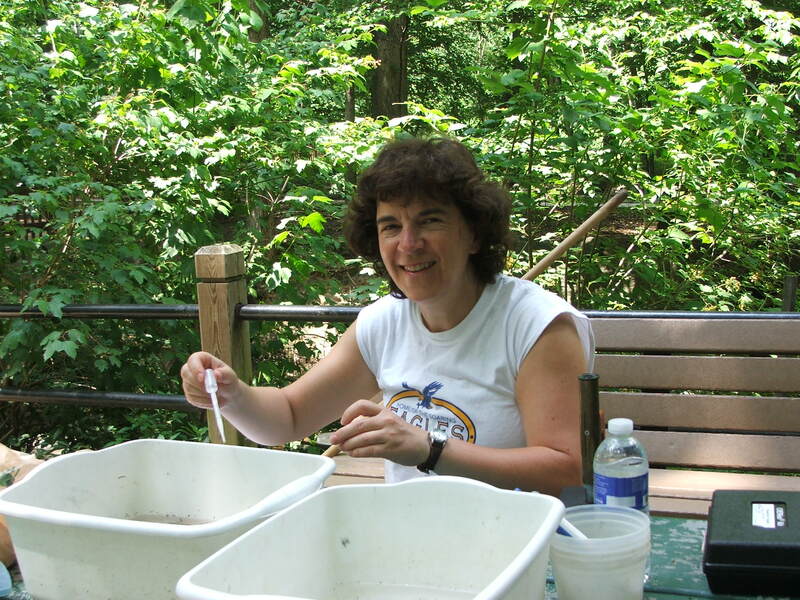 To get involved, contact Jen McDonnell at jmcdonnell@arlingtonva.us, Manager of the volunteer stream monitoring programs and stream monitoring. This entry was posted in Citizen Science and tagged lubber run, restoration, water quality by armneditor. Bookmark the permalink.